Don't let the tests parrot the code. Focus tests on areas where you expect failures. Before I go on with this post, I would like you, Dear Reader, to read those rules again, think about them deeply, and answer the following questions: have you ever seen a test that was useless because it violated rule 1? Have you ever worked on a piece of software that had lots of tests, but still let lots of failures happen? In hindsight, did some or many of those failure concentrate in particular areas? More generally, due the rules seem true to you? Do they seem helpful? Or are they so obvious that they wouldn't even need to be stated so explicitly? Or might the opposite be true: the rules are too general for an ordinary developer to apply them well without further instruction? For example, what degree of redundancy between test code and production code constitutes parroting? How would an ordinary developer know in which areas to expect the most failures? And when I had that last thought, it occurred to me that the same is probably true about most “rules” or “guidelines” in software engineering or, for that matter, in any practical field. The best and most talented people always act in accordance with some unwritten rules and are often not aware of it. It takes other people to formulate those rules and even more people to reformulate them for specific audiences, discuss examples, do one-on-one coaching, ... until every ordinary practitioner of a particular profession has adopt the guideline into his daily routine. Many good engineering (or life) rules sound simple and obvious, yet they require good judgement and/or lots of experience to be applied well. And now, it's time for your comments! Instead of writing a lot about programming as I usually do, this post is made up mainly of code. The background story is that I was terribly offended by a piece of code I found on the web. So I rewrote it, documenting my process and design decisions on the side. I was very happy with the resulting code I got, but never had the time to rewrite the process and design description for publishing. My code, however, is always written to be readable for anybody, so I am publishing it here without any comments. Here's Uncle Bob's solution; copied from his long post where he and a coworker derive it TDD style. (Code-highlighting on Blogger seems really hard to do, so for the moment, I need to feed you black and white code. Sorry for that!) Don't worry about the actual purpose of the code. If you want to learn the rules of bowling scoring, you can read them from the declarative program given below! -- how many bonus throws are counted into a frame? assert_equals a b | a == b    = "ok"
| otherwise = "expected: " ++ show a ++ "\n"
Given how easy that was, we now have a clear picture of the solution algorithm and design which we only need to port to Java. It's not exactly I one-to-one port, but you'll recognize the spirit of the algorithm. If you don't have the time to study the code in detail, at least have a look at that one line in Frame(..) which says: this.score = previousScore + throwsScore() + bonusScore(); I think that this is as close as we get to formulating a really direct and concise specification of the score of a frame. Finally, sorry for improvising some of the Matcher / Assertion stuff as I don't have all the proper tools installed right now. 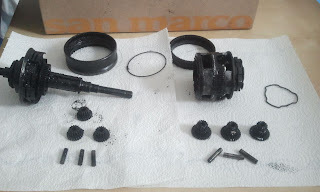 On a beautiful day in 2011, when I visited my favorite Berlin bike builder and dealer on the Schöneberg Island, I noticed that he used the shell of a Shimano Inter-8 gear hub as an ash tray. 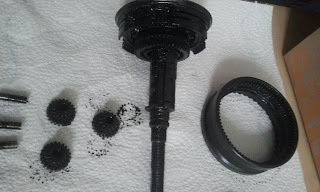 When I asked him about the piece, he told me that one of his customers or friends had serviced the gear hub and not reassembled it correctly, making the ball bearings smash when he used it again. (including carrier shared by both stages). I asked for the innards of the hub which Conrad still had below a shelf in a corner of the shop. He gave them to me and this week I finally got around to look at them more closely. I already knew that this hub is logically composed of two stages of planetary gears. One has two gears, the other four. Both can be switched independently to give eight gears and the ratios of the cogs are tuned in such a way that the eight gears have roughly equal spacing and no gear overlap. (So logically they work like the 3×8 gears of a 24 gear derailer system, only that all the gears are shiftable in sequence.) After disassembling the hub, I counted the teeth of all the cogs and used the counts to calculate the gear ratios. I was happy to find that I just got the same results that are published on several places of the Interwebs. For those who can't wait to see them, here's my calculations. All others can first read on to find out how this stuff works. Actually, those who've never read anything about planetary gears, go start with my introductory blog post on planetary gears to learn some of terminology. Then come back to find that I am experimenting with different terminology here (after all, this is a work in progress and I need to figure out what works best). For now, let's say “cog” to the little toothed round devices that turn inside the gear hub to translate speeds. Then we can use the word “gear” for the resulting ratios of speed, just as you ordinarily do when you say “first gear, second gear” and so on. Now, here's a summary of the hub's architecture: since both stages share the same planet carrier, the carrier serves as the one and only power transfer between the two stages. The carrier is therefore output of the first stage and input of the second stage, which conveniently serves the fact that the first stage reduces speed, while the second stage increases speed. In both stages the sun cogs are locked and the ring cog serves as the other moving part. (In the second stage, there are three sun cogs locked via switchable one-way ratchets.) One-way ratchets (aka freewheels) are used in many places in the hub. Thanks to the freewheels several gears can be switched “active” at the same time which has two key advantages. 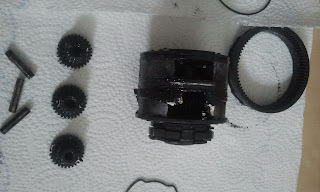 One, when shifting gears, the mechanism only needs to activate or inactivate the higher gear, while the lower will automatically be inactive (freewheel) without being actuated by the shifting mechanism. The second advantage is that during shifting (or when there's a problem with the shifting cable), there is never a no-gear stage, since the lower gear will always be active as fall-back in case that the higher gear doesn't engage properly. Reduction stage with two planet sets. Here's my calculations again for those who I made curious. I've already got a follow-up post in my head in which I'll explain the formula that the spreadsheet is using. During the past year at work, I had trouble with mock objects several times. Often tests would break because the mocks were hard to program or to change. In one case, we missed a critical bug because our mock differed significantly from the real implementation. Since I didn't have any experience with mocking, I didn't know how to improve any tests towards a best practice solution. I found a lot of code smells, but only for a few of them, did I know how to actually make it better. At one point I thought that mocks were more trouble than they're worth. Fortunately, I also had some good experience with mocks during this year, which led me to the conclusion that in the bad cases, mocks were just badly used. Thinking about it now, some of the tests that I had to deal with seemed to be written under the motto: “Mock everything but the class you want to test.” Thinking about it, a much better motto would be: “Test every component in an environment that is as production-like as possible and mock only if there is a good reason to do so.” In fact, Wikipedia says the same and even lists valid reason for mocking. The valid reasons I personally experienced are the following: speed and simulating rare behavior. There are many instances where we mocked for speed: using an in-memory database instead of a remote one or stubbing calls to remote services. The rare behavior that we simulated was when testing handling of network errors. Instead of simulating real network errors (plugin out cables or intercepting packet traffic??) we just stubbed the interface that does the networking and let it throw a SocketException. That's a perfectly valid reason to use a mock! While reading the Wikipedia article I noticed the words “indirect input” and “indirect output” of objects under test. This made me think that some uses of mocks might just be needed because of a bad software design. Before taking out the mocking framework, shouldn't we check if the code can be written with direct input and output? For small functionality, input is just method parameters and output is the method result. For bigger functionality, input is given via setters or constructor parameters and output again is the result of the method under test or getter methods called later. For even bigger functionality, some of the input (or context) will be supplied in the form of other objects that first have to be constructed. When there's lots of those objects, tests will obviously not just span the object under test, but also the classes of those other objects. Maybe you think that's too big for a unit test, but I think it's just fine for a big unit test. If those other classes have complex behaviors they will have their own unit tests that will have ran green every time before the bigger test runs. So we don't risk to test too much at once, since the lower layer of the application is already tested.